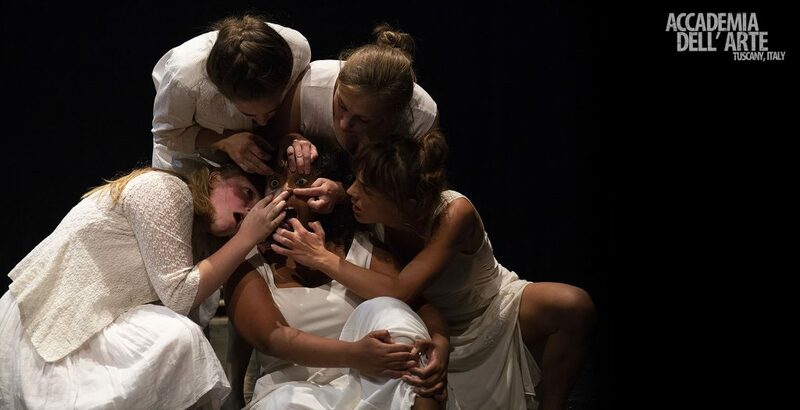 On behalf of the entire Accademia dell’Arte family we’d like to congratulate the students of MFA Cohort V on completing the practical portion of the MFA in Physical Theatre program and on a successful run (and tour) of their final performance, What’s Left Behind. This also marked the conclusion of the students’ residency with Divadlo Continuo Theatre in the Czech Republic. These same students arrived a little more than two years ago to begin the training, study and collaboration that has led them to this exciting milestone. Below, the MFA students share their experience during the Continuo Theatre residency, reflect on the last two years and gaze ahead at what they hope – or already have planned – for their next steps. Intense. Strong. Communal. Exhausting. Active. Wild. Unique. – A few ways the students of MFA Cohort V described their time with Continuo Theatre. Q: After performing What’s Left Behind at Plum Yard, it had a mini-tour through the Czech Republic. What was this experience like and how did the different locations and venues vary? FAITH: It was a great experience! All the venues were really nice, and every one was a different size, so of course we needed to spend a lot of time adjusting to what that meant for the spacing of the show, especially because we use long planks as props and the set! I think I had more fun every time we did the show. SLOANE: It was really fun, but also stressful to tour after the premier of “What’s Left Behind.” We’ve never performed a show multiple times and some of us had never toured at all, so it was an interesting task to try to bring new energy and light to the performance each night. I also enjoyed the problem solving that went into adapting our original blocking to each new space in such a short amount of time. I think that added a spark to the show each night of the tour. Click here for performance photos from What’s Left Behind! 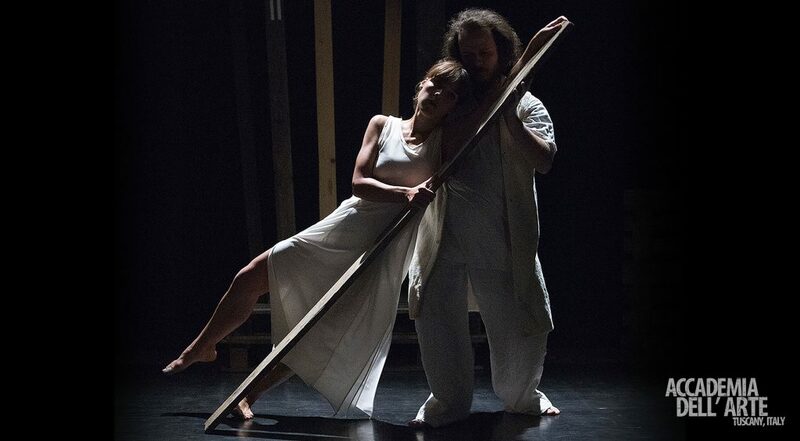 *All photos by Adéla Vosičková, Continuo Theatre. 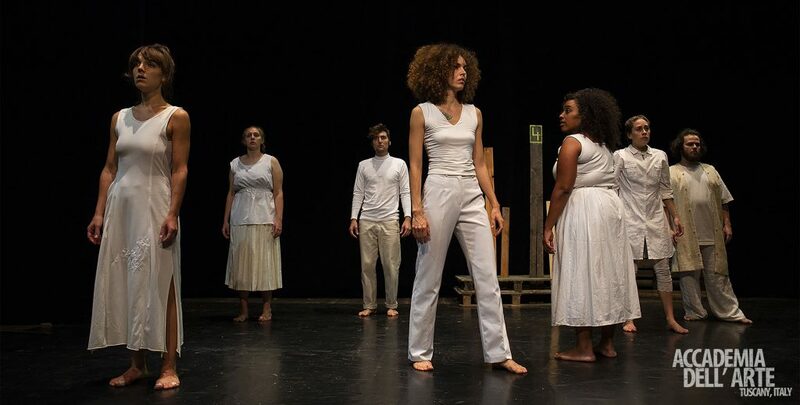 To fully complete the MFA in Physical Theatre program, each student must submit a written thesis. Now that classes and performances are finished, the MFA students of Cohort V have turned their focus to this work. Some students have returned to the U.S. (or their home country) while others now consider Arezzo their home base. Q: Can you describe your thesis project and where you are now in the process? SLOANE: As the authentic collective and individual, black women are often plagued with racist and sexist imagery in film, television, and theatre. These racist and sexist images have been a part of the black female narrative spanning all the way back to slavery in the United States. The purpose of my thesis is to examine the negative stereotypes and characterizations of the American black woman, while also examining theatrical works and new forms of theatre written/created by and for black women in a predominately white society. FAITH: My thesis project is essentially about sexual and gender politics in the works of Caryl Churchill. At this point, I’m finished with the research phase and am working on my outline. NICOLE: I am writing about the connection between shamanistic practices and theatre, specifically focusing on liminal space in performance. I will compare Japanese Nō drama and Pina Bausch’s Tanztheater. I am still researching. RUTA: My thesis is related to second language and how to perform in your second language. LINDSEY: My thesis is about using humor by way of clown as a form of self discovery for the actor. I am in the second draft of the process. The past 2+ years have been a journey of classes and performances; creating, critiquing, studying, training and traveling. At times it felt like the program flew by and other times like time stopped completely. Now that the MFA students’ practical work is complete, we’ve asked them to look back on their experience in the program and also share a little about what the next chapter might hold. Q: Now more than a week after closing your final performance of the MFA program, how do you feel? Accomplished, proud, relieved, exhausted? SLOANE: I’m definitely feeling proud after finishing our final performance. It’s still quite fresh and unreal to think that the practical portion of our MFA is complete. It hasn’t hit me yet! It just feels like we’re going on break a bit early and we’ll all be back at it in January! FAITH: I definitely feel exhausted, but it still hasn’t sunk in that we’re done yet actually! It feels very strange right now. Q: What’s something that you know now that you wish you would have known on the first day of the program? NICOLE: How grateful I would end up being for the relationships and connections I have made over the two and a half years of the program. LINDSEY: Mental strength can bring you a long way. This program is challenging physically as well as mentally and if you don’t have a solid foundation, it’s easy to feel lost. The creation process can bring out a lot of different qualities and struggles for each person, and that’s ok.
SLOANE: That I am capable of almost anything if I try hard enough. FAITH: I honestly wish I would have known how much I was going to love it! I would have saved myself a lot of unnecessary nervousness. HEIDEE: There are no rules. Q: Arezzo, Torino, Berlin and the Czech Republic … some of it probably feels distant and some very present. How are all of these experiences starting to come together and how is it impacting your identity as an artist and the type of work you hope to pursue after you complete the program? FAITH: All of these experiences gave me really important tools for the future. I loved that we got to see different institutions’ approaches to devising and performance, as they were all so different. I also really discovered new passions during these processes that I never expected and that I’ll be pursuing in the future. I also feel like the kind of artist who now has experience adapting to all sorts of working methods, directors and teachers. NICOLE: The diversity of locations, cultures, and the depths of experience from each unique place has influenced my thoughts, work, heart and future aspirations greatly. I know I want to remain in Europe and hope to one day have my own residency centre. RUTA: All these cities were amazing. In this program we travelled a lot, and after this program I have some projects in different Europe cities, so my journey is still continuing and I am traveling. Through January I have some projects in the theatre field. LINSDEY: As an artist I feel strongly about creating, but I am looking forward to bringing this enthusiasm to a more “traditional” approach of theater to see how it can add more value to a script based production. SLOANE: For sure, all of the work we’ve done over these last two years have influenced the way I want approach any and all types of theatre, but I’m particularly attracted in implementing the new vocal techniques I’ve learned to future works. Q: What are your immediate plans now that you’re done working in the Czech Republic? RUTA: I will go back for vacation in Lithuania for two weeks, then I will be doing a small music project in Arezzo. In December I was invited to be an assistant in a Physical Theatre Conference in Austria. HEIDEE: My immediate plan after I leave the Czech is to continue creating and developing my work. I have a couple of auditions – I’m particularly looking forward to audition for Farm in the Cave (CZ) – But I think I will always maintain a home base in Arezzo. There, I work on a project basis with a local performance group, Broken Jump, directed by Sam McGehee. The company has become something of a family. NICOLE: I will return to Italy to write my thesis and to work with Broken Jump, a company directed by ADA graduate Sam McGehee, as well as beginning a new project with Giangiacomo Colli and André Casaca. SLOANE: I’m heading back to Arezzo for a final goodbye and then going home to Houston to work on my thesis and look for a job! Oh, the joys of postgrad life! LINDSEY: I will be stopping in London on my way back to the states to complete my thesis and start searching for opportunities. FAITH: I will be returning to Italy to work on my thesis! Q: Do you miss anything yet? What most? SLOANE: I’m actually responding to these questions while waiting to board a plane back to the US, so like I said before it hasn’t really hit me yet. I think within the last week I’ve missed not going to class. I miss not seeing my cohort members. Its strange to go from living and working with people for six weeks and then suddenly all going separate ways. It’s going to be quite an adjustment, but also very exciting because we have so many great things ahead of us! FAITH: Yes! I miss being in class all day every day! Q: What’s one piece of advice you’d like to share with the next MFA cohort? NICOLE: Learn to live and love discomfort and uncertainty. Get comfortable with being “bad” at something! it is the only way to give space for discovery and improvement. LINDSEY: Take care of yourself, but be willing to be vulnerable. FAITH: Try every new thing you can (this program is great for that) and you’ll be very surprised at what you fall in love with! Of course you will also sometimes fail really spectacularly, but growth doesn’t happen unless you take the risks! RUTA: Be open, friendly and take all the opportunities from this program that you’ve got. If you go to different countries go and find local people. Don’t be afraid to explore different countries. SLOANE: Be vulnerable and malleable! So much is going to happen while you’re in this program, make sure you’re available for all the transformative lessons this new world has to offer you. Interested in a summer training or study abroad opportunity? 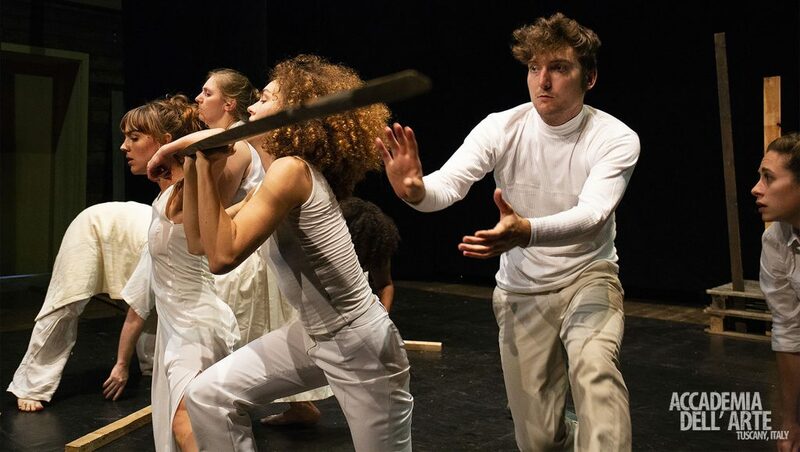 Check out the Summer Physical Theatre Intensive or Summer Dance Intensive. Both programs are held June 16 – July 13, 2019. Plus, register by December 1, 2018 for $100 off the Program Fee!